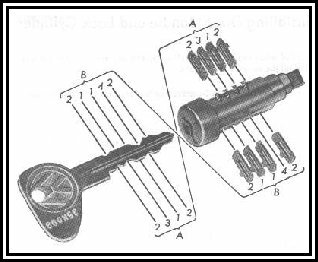 All the Type 3 and Type 4 (and many Beetle/Bus too) door lock barrels are similar, but their overall size differs, as does the profile of the key (the grooves along its length). This changed from time to time, to increase the possible number of key combinations. For key profiles read the August 1997 Wolfsburg Wired from Wolfsburg West. The barrel contains 8 pieces of brass with slots, called tumblers (9 in the ignition switch barrel) and 8 (or 9) tiny springs to push them out. Each tumbler has 0, 1, 2 or 3 notches on its end, which is a code telling you how long the cut out slot is (matching 1,2,3 and 4 in the picture). The right key pulls in all the tumblers flush with the barrel, but the wrong key leaves some or all sticking out a bit, which prevents the barrel turning. Check the diagram (from official manuals, thanks VW!) carefully, to see how the key shape matches the tumbler slots. This is the key (sorry!) to changing the tumblers to match your other locks. Door locks are easy, and you can pull apart old barrels to get the right tumblers. According to VW, ignition and tail-gate barrels cannot be standardised. The latter are pinned in place and could be damaged by removal, I guess, but I'll try it one day! If you need a key cut, your (long-established) VW dealer may have the code books to tell him what shape your key is from the number on the lock (stamped on the handle mechanism). Mine can do it, but maybe I'm lucky! If you change the barrel, paint out the old one and mark on the new number! Next inspect the machined hole the cylinder rotates in. Each side there should be a groove that the tumblers locate in when the key is removed. (On my handles there were deep grooves, indicating that the tumblers had been forced round in the vehicle's previous life). As there is no way to repair this damage, I was fortunate enough to find two new handles at VW Action, but good second-hand ones would suffice. The next problem I tackled was the lock cylinders themselves. Before removing the key, I cleaned up the exterior of the cylinder and made a note of the order of the tumblers. There are four different types, marked blank (no markings), I, II or III. Now having this information, I removed the key to allow the tumblers to fall out - they didn't, much to my surprise. The hang-up turned out to be simply the amount of grease and dirt on them. I removed each tumbler and spring, and washed them in methylated spirits, along with the barrel itself. Upon re-assembly, I stretched all the springs slightly, to make them a tighter fit in the handle. No oil or grease was used in the assembly as locks operate best without them. A dry lubricant such as graphite or molybdenum disulphide should be used. With this carried out the vehicle is now as secure as when it was new, at a minimal cost. Mind you, I am being very careful not to get locked out again.